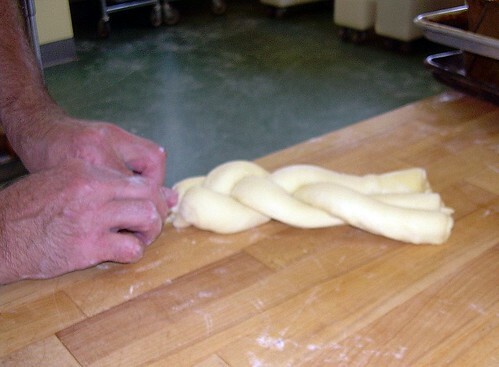 As promised, here is another entry about my advanced baking class at King Arthur Flour. In keeping with my previous post about brioche, I thought I’d show you another item that we baked, something that is not common in this country: Brioche Feuilleté. If you don’t eat butter, read no further. Brioche Feuilleté has a LOT of butter. Did I mention butter? Actually, we made three mouthwatering breads with the brioche dough: brioche feuilleté, coffeecake, and bienenstich (bee sting). 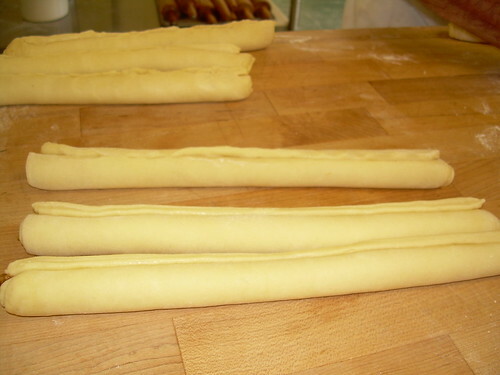 Today I’ll talk about brioche feuilleté, and save the other two for another day. Soon, I promise. Well, what can you say about taking brioche dough, which is loaded with butter, and laminating it (like puff pastry) with MORE butter? Yum. Pass it on down. Brush the top edge of each strip THINLY with egg wash, and then pipe the filling in a thin strip near the bottom edge. 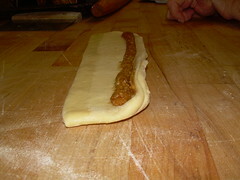 The filling was a mixture of ground hazelnuts, puff pastry crumbs (you can even use old bread crumbs), simple syrup, and egg whites. Roll each strip closed, pinching the bottom seam if you have to. 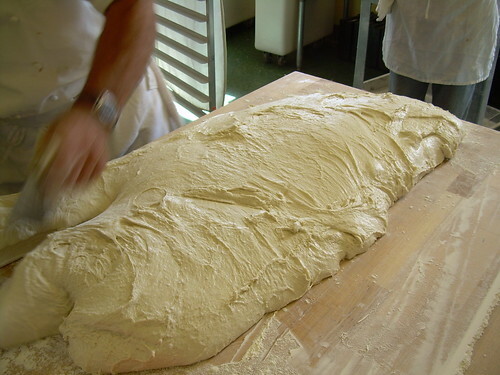 Keeping the seam side down, braid the three strips together and place in a standard loaf pan, brush with egg wash, and let rise until puffy. 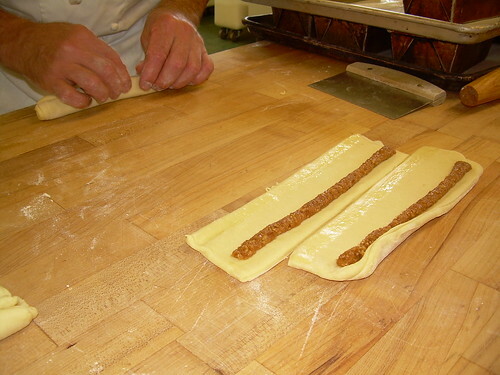 Then bake until it’s a rich, deep brown and the sides are firm. 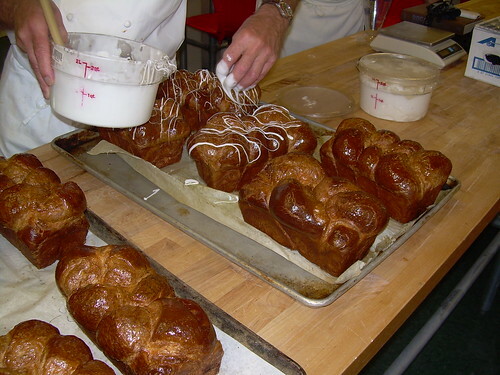 Baking temperature is about 350 F, but no higher than 375 F.
When the loaves were done, we brushed them with an apricot glaze, which I could have eaten straight out of the pot, and then Chef Hamelman drizzled a fondant glaze over the loaves. This was so good, I was practically beside myself. The aroma was incredible. 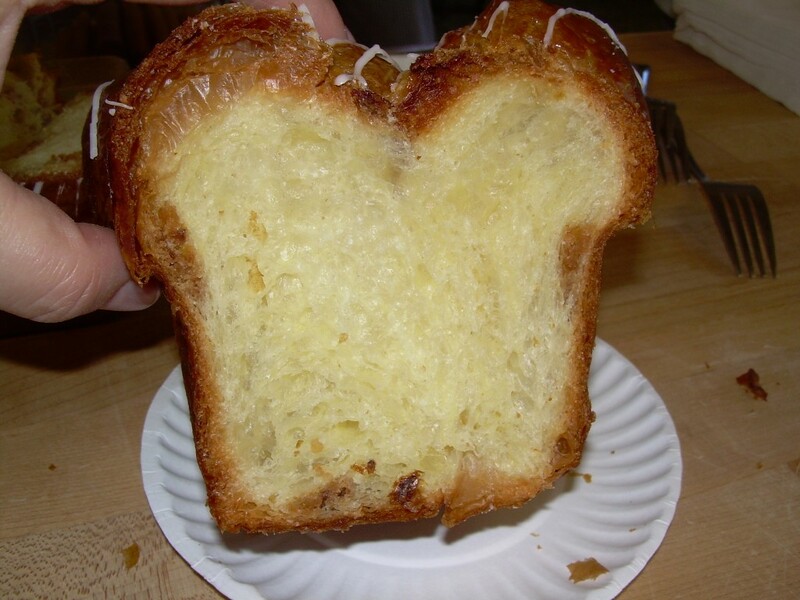 Buttery, fluffy brioche with little pockets of sweet nuts from the filling. Amazing. Its even good when it’s stale – just toast it. You can even top it with more butter, if you dare! This post has been Yeastspotted!